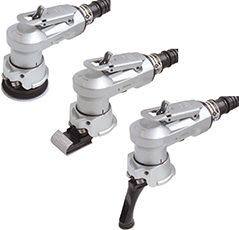 Excellent for sanding on narrow, confined, and hard-to-reach areas with three types of pads. 2" Velcro Abrasive Disc #80: 2 pcs. 2" Velcro Abrasive Disc #120: 2 pcs. 2" Velcro Abrasive Disc #180: 2 pcs. 26 x 50 mm Velcro Abrasive Sheet #80: 2 pcs. 26 x 50 mm Velcro Abrasive Sheet #120: 2 pcs. 26 x 50 mm Velcro Abrasive Sheet #180: 2 pcs. 16 mm Self Adhesive Abrasive Disc #80: 5 pcs. 16 mm Self Adhesive Abrasive Disc #120: 5 pcs. 16 mm Self Adhesive Abrasive Disc #180: 5 pcs.